I kinda resolved this summer to break away from cycle of disaster-driven upgrades. More or less done with Mini-ITX system and another component clearly in need of replacement was my old 19” Acer display. I was eyeing several large monitors and one I was able to catch available and purchase was Asus 27T1E – 27” display and TV combo. HDMI for video and audio (in spirit of reducing clutter). 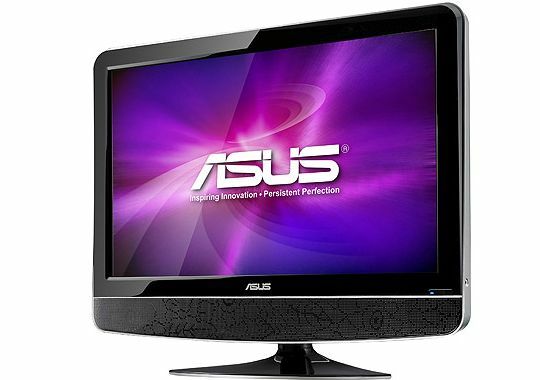 Asus site lists this one both as part of regular widescreen displays and part of TV monitor series. Using LCD TVs as affordable large screen computer displays is hardly new idea, Asus just makes it kinda official offer here. Essentially TV monitor series are TV units (with analog+digital tuner) that are marketed for use as computer displays. Result is somewhat tricky. Note that there is no DVI or DisplayPort. Since I was going to use HDMI anyway I didn’t brood much over DVI. Researching before purchase I came up on several mentions that there are issues with native resolution of 1920×1080 when using HDMI. I thought it’s probably nothing I can’t solve… And I stayed solving that till 3AM yesterday. It turned out Asus was being lazy with their product, NVIDIA was being lazy with their drivers and then they met at my desk. When connected through HDMI native resolution was horribly distorted and larger than screen. Turns out that stuff is called overscan. explain to display that it needs to treat input signal as one from dumb computer… which Asus didn’t bother to implement. Many Internet pages and arcane tutorials later I had decent understanding of issue and possible fix. Display reports extended display identification data (EDID) with some extras that confuse video driver. So if we override extra part then driver stops over thinking situation and simply serves straight HD. Windows display id (after \Video\) is unique to OS installation and first four bytes of hex stuff (04,69,f4,27) are hardware id for specific display, unique to 27T1E model. This fixed resolution for me… But display went mute. bad that display ignores that input when connected by HDMI and Asus didn’t bother to implement option to control this behavior. So video card driver refuses to send digital audio and display refuses to listen to analog audio. I went through manual and according to it for HDMI transmitted without audio you are supposed to use separate RCA audio input instead of 3.5mm one. Luckily my (now deprecated) speakers had such cable, which I promptly looted and got both video and sound working properly at the same time. Aside from some hours of dealing with crazy overscan issues display is actually very nice. 27” screen size is very spacious. Excellent for browsing and coding, gorgeous for video. 2x 7W speakers are decent (not worse than generic speakers I had for like ten years) and deliver more volume than usual for integrated in display. Volume controls are conveniently on top of display and there is headphones output on the right side (sadly no microphone one). For calibration I tweaked colors in NVIDIA control panel wizard. Was also going to adjust contrast and brightness but came upon ASUS Smart Contrast Ratio (ASCR) in display menu that controls those automagically by analyzing current input in real time. Trialing it on, so far so good. Don’t really need TV part, I’d actually prefer TV-less MT276H model, but it doesn’t seem to be sold around here. Asus did absolutely horrible job of adapting LCD TV to the role of PC display. Many generic LCD TVs are actually better adapted to be used in that way, even without being marketed for it. Aside from that what you get is large full HD display (with TV tuner on top) with good image quality for moderate price. I gave up on any kind of monitors and just use hdtv’s instead a couple years ago. I use 4 on this system. My mobo has 4 pcie slots and at one point, I considered using all 4 because I can make people sick with my display’s. Hyperspace, or Lattice (rssavers) usually does the trick. I love it, although reading webpages at 1920×1080 can be a little trying. yeah, 37″ Dynex’s (Cheap 1080i Best Buy brand). It’s overkill but every time I’ve tried to scale back, I feel like something’s missing, and the few times I tried invoking the third card, I thought my girl would leave me. So 4 seems to be my limit. Can’t keep an active screen saver because she says it makes her dizzy, so I use DarkScreen at night. Heh, I was on dual-screen setup for some time. But despite it being the ultimate techie thingie I found it inconvenient. For me it is faster to switch between windows on single monitor than drag my attention from one to another. Easier to keep attention focused as well. I purchased exactly the same screen today, Asus 27T1E. I have a question. Before this I used a 24 inch Samsung. I connect my pc with hdmi and I have a ATI 5850HD card. With the drivers of last year october!! I had perfect view on the Samsung. In july this year I updated the drivers of the card. After that I had the same sizing problems as you had. After a looong search and tries of different versions of drivers, I ended up restoring the system back to a day before and that solved then the problem of oversizing. Anyway, I bought this screen because I wanted a bigger screen. I saw it in discount somewhere. After connection with hdmi and updating my drivers of the ATI card, I had no significantly problems with the sizing. Only one question: does your screen also seem a little bit blurry/bad when it comes to read text and websites?? In comparison with my Samsung, which had crystal sharp image, I find this screen complete disaster in that way! I tried severals settings but can’t seem to get the same sharpness. It doesn’t seem normal to me that bad text. Text should be perfectly clear and normal, like on any regular TFT screen. If text is blurry likely it means you still have issue with image not being perfectly aligned with screen – pixel for pixel. This was typical situation in times of CRT monitors (they could work with multiple resolutions just fine) but for TFT this ends up being catastrophic loss of image quality. Unfortunately I had my portion of troubleshooting on integrated nvidia card, so I have no idea if and how many of my experience applies to your case with ati card. I’m considering to get this monitor and I’m aware about its EDID problem. Although the issue can be solved with the Registry hack in case of a PC with a NVIDIA card, I’m not so sure about possible problems with other HDMI peripherals. Like XBOX360 or other HDMI sources. Because in that case you can’t ‘hack’ your XBOX to make it emit the correct signal as you would do on your PC. I’ve tried to Google for possible HDMI probs, to no avail. Have you tried to plug other peripherals other than a PC to this monitor’s HDMI port? Did that work OK? I’m especially interested about XBOX. The issue in post is from precise combination of dumb decisions from Asus and nvidia both. I have no idea how would it behave with another input. I do not own XBOX and my only other HDMI source is notebook that also has nvidia video card (so same drivers and same issue). My rough guess is that it should work fine without PC drivers overthinking and messing up signal type. But to be really sure your best option is to drag your XBOX to store that will allow to unpack and test before purchase. By the way since I bought this one several 27″ analogues from Samsung and LG appeared on the market. Google around, they might have done better job at adapting TV to monitor. I did use the old monitor as a 2nd, but laying it sideways (and rotated 90 degrees in the driver) so that the old monitor is better for reading (..long threads like this one..) and the new one is better for most everything else. That dual purposing has defeated the otherwise inconvenient issue that my attention is likewise absorbed by one display or the other. Something I discovered later with another monitor – ATI drivers have the perfect option to control overscan. A little hard to find, but at least they have it at unlike nvidia crap. I had chance to try that setting myself with large LED monitor, connected via HDMI and I can say it completely fixed overscan issue. Perfect pixel-to-pixel picture. That crap of messing with resolution on other hand is ugly for either nvidia or ati, it just ruins image. I am still fighting with the asus 24T1E and a HP DV6 Notebook (i5 2410 with Intel IGP + ATI 6770). Can’t get it right – can anyone help? ATI drivers should have much better controls for overscan/underscan (unlike nvidia that refuses to implement them). I think posts on this I know mostly show for older driver interface, so just poke around – should be somewhere in settings for specific monitor or around that. Hey, thanks for this great tutorial, I got it working well…except sound. Cause for me, chinch does not work. In general, nothing works concerning sound. Not in vga mode, not in hdmi mode, neither chinch nor 3,5mm. Sound is working well with TV though. As per post with this tweak you need to use red/white RCA connectors for audio, not 3.5mm. If you look at the back connectors are grouped together with lines. RCA (which you need) is grouped with HDMI, 3.5mm (won’t work while using HDMI) grouped with VGA. thanks for the fast reply. Yeah, I tried those as well. Actually having the same for my hifi-speakers so I could use them as you did. Just that on the monitor, they don’t work.. By now I figured how to make it work with vga cable though, was not so complicated finally. Now I gotta fine resolution and sound via 3.5. Does it have something to do with me using dvi to hdmi cable? Will the RCA only work when using an hdmi to hdmi cable. I do btw have an nvidia gts250, new drivers for audio / video (from october 2011) are installed. Hi there, I came to this page because of overscanning problems with an ASUS 22T1E. I tried many solutions, the EDID overwriting worked for me, but I could’nt get the audio, even with RCA cables (linked near the two HDMI ports). I just wanted to inform you that on Ubuntu 11.10 (and also on previous versions) with the generic driver, the monitor worked at 1920×1080 witout overscanning problems. It was like a dream. But, heh, it had no audio (I’m using audio through HDMI), so I installed the Nvidia drivers. Yes, audio was working fine the next reboot, but there was als the overscanning. P.S: Could you please post an image of where you linked the RCA cables? RCA jacks near HDMI should work, at least they did for me… I’ve recently changed computer and couldn’t make HDMI work with new one at all (Core i7 integrated video). :( So now I am stuck on VGA. I am so tired of this crap I would probably just look into buying new display this year. Thank you for the answer. The RCA cables seem to sream audio working only while the PC is booting (I was tryin’ to play music from my phone, and for these seconds I was hearing the music). That could sound quite normal, as I’m playing audio trough HDMi normally, but how can I disable the HDMI audio? In the Nvidia Control Panel there’s an option, but when I disable the audio, the RCA port doesn’t work. I managed to port audio in HDMI with a jumper on my graphic card (Nvidia 9800 GT, Palit manufacturer), linked to the SPDIF audio port of my PC. I’ve seen suggestions to disable HDMI audio by disabling driver in Device Manager, but it doesn’t seem to be very reliable/convenient method. Hello Rarst, thank you for this tutorial and sharing thoughts. I too think Asus did absolutely horrible job of adapting their LCD TV to the role of PC display. Now that AMD fixed it I have no problem with hdmi scaling with my Radeon 5870 and ASUS 27T1E. But yet I’m very, very very much dissatisfied with its rather insufficient level of black color which makes this monitor colors and contrast rather vague as compared to those in majority of PC optimized monitors. Do you, or perhaps anyone else feel this, or is it just me? I hadn’t much luck fiddling with display controls and mostly applied some adjustments in display driver (don’t remember specifics, I think I moved gamma and brightness a bit). Well, I guess kitchen is where it fits then. I’m never gonna buy again a TV screen for PC role. An occasional PC role such as notebook connect – yes, on a regular basis for desktop – never. Vague colors. It’s a TV, not a monitor really. Good luck to you with those 27″Nec’s. And thank you for your replies. To be fair TVs (even genuine, not marketed as computer displays) from other manufacturers (like Samsung) have much better adaptation to work with computers. On other hand nowadays there is no shortage of 27″ displays and they seem to be moving towards high resolution IPS at better price. I too have heard Samsung’s are better than ASUS for higher (or just better) contrast and richer colors. Tint (?) it appears greyed out all the time, what’s it for? What’s Tint for? How can you move the slider? No idea, as above – I mostly adjusted computer-side. I think available tweaks on display depend on how it is connected (VGA / HDMI). Arr…right, obvious, it’s unavailable over HDMI. Unfortunately there is nothing resembling proper driver for this display. For what Asus calls driver they provide several INF files with color profile, which improves picture somewhat but by no means drastically. being what, where do you get those files? As far as I can reach on asus support, there’s only 26 manuals and that’s it. Link plz. I’ve submitted my technical inquiry form and will talk to them more if they reply. They should write a driver that would turn this spacious display with high contrast and brightness capacity into a true monitor, fixing scaling and picture. If they come up with a USB-flash fix, they should add gamma control to the remote picture adjustments list. Can’t find it now, so probably they don’t even provide that anymore. No luck writing to the support, they didn’t even answer my request ticket and only marked it ‘Close’. i have a 24T1E TV/Monitor and i have the same overscan problems. The fact is if i set 0% of overscanning in Catalyst the pic goes off of the corners. @Ruben, HDMI scaling is often unavailable at resolutions other than the monitor’s native. You may want to report your issue to AMD. Try scaling HDMI when your desktop is set to the maximum resolution supported by your monitor, and try other resolutions as well. Make sure the refresh rate is set as recommended for your monitor, usually automatically. And finally be sure you are using 4:4:4 full RGB pixel format.